Average weekly earnings of non-farm payroll employees were $1,000 in June, little changed from the previous month. Compared with 12 months earlier, earnings increased 2.8%. Non-farm payroll employees worked an average of 32.8 hours per week in June, little changed from the previous month and from 12-months earlier. Compared with June 2017, average weekly earnings increased markedly in 5 of the 10 largest industrial sectors, led by retail trade. At the same time, earnings declined in administrative and support services. In retail trade, average weekly earnings rose 8.6% to $604. Gains were spread across a number of subsectors, including motor vehicle and parts dealers, as well as general merchandise stores. Ontario contributed the most to the year-over-year earnings growth in the sector. Among employees in construction, average weekly earnings increased 6.0% to $1,271, led by speciality trade contractors and construction of buildings. 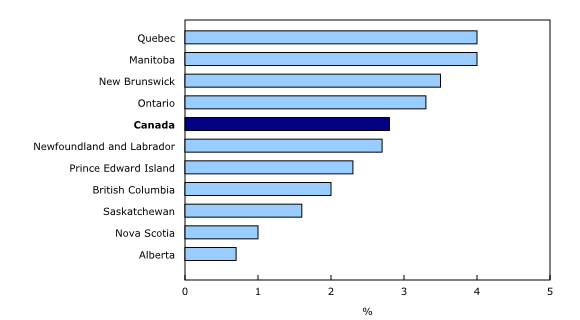 Ontario, Quebec and British Columbia accounted for most of the earnings growth in the sector. In accommodation and food services, earnings grew 4.2% to an average of $404 per week, continuing the upward trend that began in March 2017. Gains were mostly attributable to full-service restaurants and limited-service eating places, the largest industry within the sector. The earnings growth in the sector was largely attributable to Ontario. For payroll employees in health care and social assistance, average weekly earnings rose 3.8% to $914. The growth was driven by gains in the ambulatory health care services subsector. Most provinces recorded increases in the sector, and the fastest growth was in Newfoundland and Labrador. In public administration, earnings were up 3.1% to an average of $1,300 per week. The rise in earnings was driven by federal public administration, as well as provincial and territorial public administration. Many occupational groups of the federal public service have signed new collective agreements in or after June 2017. Among the provinces, the fastest pace of earnings growth for the sector was in Quebec, Newfoundland and Labrador and Manitoba. In contrast, average weekly earnings decreased in administrative and support services, down 2.5% to an average of $806 per week, partly due to earnings being at a relatively high point in June 2017. The decline was driven by office administrative services. Alberta contributed the most to the decline, while a notable employment increase in Ontario, where earnings were above the average for the sector, moderated the overall earnings decrease in the sector. On a year-over-year basis, earnings were little changed in manufacturing; educational services; professional, scientific and technical services; and wholesale trade. In the 12 months to June, average weekly earnings of non-farm payroll employees increased notably in eight provinces, led by Quebec and Manitoba. At the same time, earnings were little changed in Nova Scotia and Alberta. In Quebec, average weekly earnings increased 4.0% to $933. Gains were spread across a number of sectors, including construction, health care and social assistance, and public administration. Earnings in the construction sector in Quebec have been on an upward trend since the summer of 2017. Average weekly earnings in Manitoba rose 4.0% to $930. Growth was spread across most sectors, with health care and social assistance, information and cultural industries, and public administration contributing the most to the rise. In New Brunswick, average weekly earnings rose 3.5% to $903. Earnings increased in many sectors, most notably administrative and support services and wholesale trade. At the same time, both earnings and employment declines in information and cultural industries moderated the overall growth in the province. 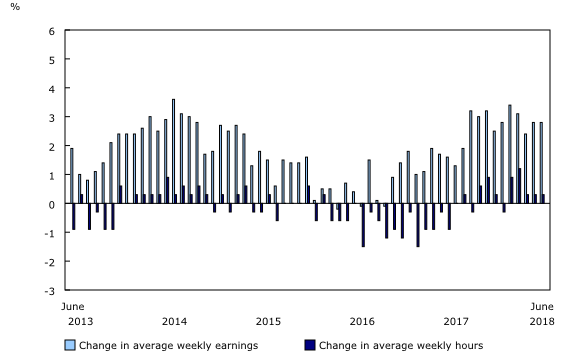 Over the previous 12 months, average weekly earnings grew 3.3% to $1,019 in Ontario, driven by finance and insurance, retail trade and construction. Average weekly earnings in Newfoundland and Labrador were up 2.7% to $1,060. Many sectors contributed to the increase, including health care and social assistance, public administration and manufacturing. At the same time, notable earnings and employment declines in construction tempered the overall growth in the province. Average weekly earnings in Prince Edward Island rose 2.3% to $834. Health care and social assistance, retail trade, public administration, and administrative and support services contributed the most to the increase. In British Columbia, average weekly earnings increased 2.0% to $963. Earnings grew in a number of sectors, with construction and health care and social assistance contributing the most to the rise. For payroll employees in Saskatchewan, average weekly earnings were up 1.6% to $1,023, driven by public administration and finance and insurance. In June, the number of non-farm payroll employees was up by 32,100 from May. The number of payroll jobs increased the most in health care and social assistance, driven by social assistance and ambulatory health care services. Employment also increased markedly in accommodation and food services, led by full-service restaurants and limited-service eating places. At the same time, payroll employment decreased notably in the "other services" sector, led by repair and maintenance, and in the wholesale trade sector. Compared with June 2017, the number of payroll employees rose by 337,400 (+2.1%). 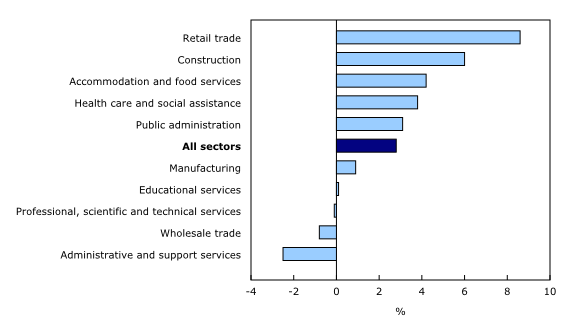 Most sectors were up, led by health care and social assistance (+55,700 or +2.9%) and professional, scientific and technical services (+40,500 or +4.5%). On a year-over-year basis, the number of payroll jobs also increased markedly in educational services (+38,900 or +3.0%), manufacturing (+37,500 or +2.5%) and public administration (+32,400 or +3.0%). At the same time, there was a notable decline in information and cultural industries (-3,700 or -1.1%). Employment in this sector has been relatively flat since January 2018. On 1 January 2016, the world officially began implementation of the 2030 Agenda for Sustainable Development — the United Nations' transformative plan of action that addresses urgent global challenges over the next 15 years. The plan is based on 17 specific sustainable development goals. The Survey of Employment, Payrolls and Hours (SEPH) is produced by a combination of a census of approximately one million payroll deductions provided by the Canada Revenue Agency, and the Business Payrolls Survey, which collects data from a sample of 15,000 establishments. Federal, provincial and territorial public administration data are collected from various administrative records provided by these levels of government. The key objective of the SEPH is to provide a monthly portrait of the level of earnings and the number of jobs and hours worked by detailed industry at the national, provincial and territorial levels. Real-time tables 14-10-0357-01, 14-10-0358-01, 14-10-0331-01 and 14-10-0332-01 will be updated on September 10. Data on payroll employment, earnings and hours for July will be released on September 27. Job Vacancy Statistics (5202) from the Survey of Employment, Payrolls and Hours for May are now available.